This is the net worth and profile of top Nollywood star Genevieve Nnaji, a Nigerian actress, producer, director, model and singer who has appeared in over 90 movies and has being active in the acting scene since 1987 with an estimated net worth of $10 million in 2019. Her net worth is $10 million and in naira as N3.8 billion this is because she just sold her recently produced movie Lionheart worth N1,385,100,000 ($3.8 million) to Netflix. 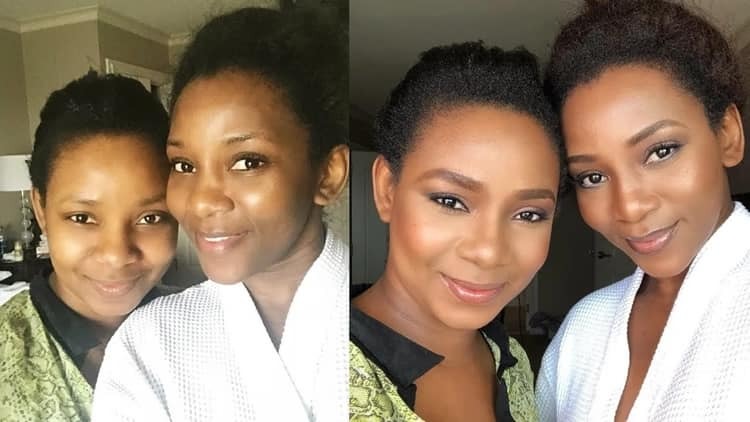 Owojela's Blog has learnt that Genevieve Nnaji was born on 3 May 1979 in Mbaise, Imo State, Nigeria to the family of Chief Theophilius and Benedatte Nnaji but grew up in Lagos; she is the fourth of eight children and was brought up in a middle class environment. Her father worked as an engineer and her mother as a nursery school teacher. She attended Methodist Girls College (Yaba, Lagos), before transferring into the University of Lagos (UNILAG) where she graduated with a bachelor's degree in creative arts. While at the university, she began auditioning for acting jobs in Nollywood. Nnaji started her acting career as a child actress in the then popular television soap opera Ripples at the age of 8 in 1987. In 1998, at the age of 19 she was introduced into the growing Nigerian film industry with the movie "Most Wanted". Her subsequent movies include Last Party, Mark of the Beast and Ijele. In 2010, she starred in the award-winning film Ijé: The Journey. Owojela's Blog can say she has starred in over 90 Nollywood movies. In her short music career, Genevieve in 2004, signed a recording contract with EKB Records, a Ghanaian record label, and released her debut album One Logologo Line. It is a mix of R&B, Hip-Hop and Urban music. In her career as a model, Nnaji has featured in several commercials some of which include those of Pronto beverage and Omo detergent. In 2004 she became the "Face of Lux" in Nigeria in a highly lucrative sponsorship deal. In 2008 Nnaji launched the clothing line, "St. Genevieve", which donates its proceeds to charity. In May 2010, Nnaji was appointed to be the official "Face of MUD" in Nigeria. Genevieve Nnaji was honoured the Member of the Order of the Federal Republic (MFR) Order of the Niger in 2011 by the Goodluck Jonathan Government for her contributions to the growth of Nollywood. She was also given a Chieftaincy title in 2014 as the Eze Ada 1 of Amuzu Nweafor in Imo State. It is known that this year she bought a mansion for $4 million in Accra, Ghana. She also has two mansions in Lekki and Ikoyi, Lagos. The actress prefers only classy cars, she has Range Rover Evoque, the price of car is around 19 million Naira and Mercedes Benz G-Wagon that costs around 30 million Naira. She does not only star in movies, she also produces and directs them. In 2015, she was one of the producers (as well as lead actors) in a movie Road to Yesterday, which won the Best Movie West Africa award at the 2016 Africa Magic Viewers Choice Awards. Genevieve Nnaji had sold her recently released movie in 2018 ‘Lion Heart’ to movie site Netflix at N1,385,100,000 ($3.8 million). This has made the actress become the first Nollywood billionaire. Genevieve has always taken extra care to protect her personal life and is known to be very reserved, but to all those who are wondering whether she is married, the answer is she is single. However, she has a young daughter of about 22 years of age. Her name is Theodora Chimebuka Nnaji, Owojela's Blog learnt that she got married in 2016. According to Genevieve she is steady waiting for the right man before she can become officially married as she is afraid of divorce, even though she is approaching her 40s. Genevieve is active on all of her social media accounts. You can find her on Instagram, Facebook and Twitter, where she regularly posts news and photos of her life. Instagram: @genevievennaji, verified account, 5.3 million followers. Twitter: @GenevieveNnaji1, verified account, 1.7 million folowers.